The Holdsworth Building is a row of three shops with residences erected in 1871 by John Daley, a local undertaker. The buildings were designed by architect George R Johnson. In c.1908 Daley sold the buildings to another undertaker, Josiah Holdsworth, whose family ran a prominent undertaking business from the centre shop until 1972 and after whom the buildings are named. The role of nineteenth century undertakers differed significantly compared to modern companies. Storage of bodies was not normal because bodies were usually kept at home before being collected by undertakers and taken directly to the cemetery. Holdsworth's presided at the funeral of the notorious criminal Squizzy Taylor in 1927, a funeral for which the bill has remained unpaid. The busiest period for the Holdsworth's was during the 1919 influenza epidemic, when up to five funerals a day were carried out by the company. The buildings are constructed from brick, which is stuccoed on the main facade but face brick at the rear. 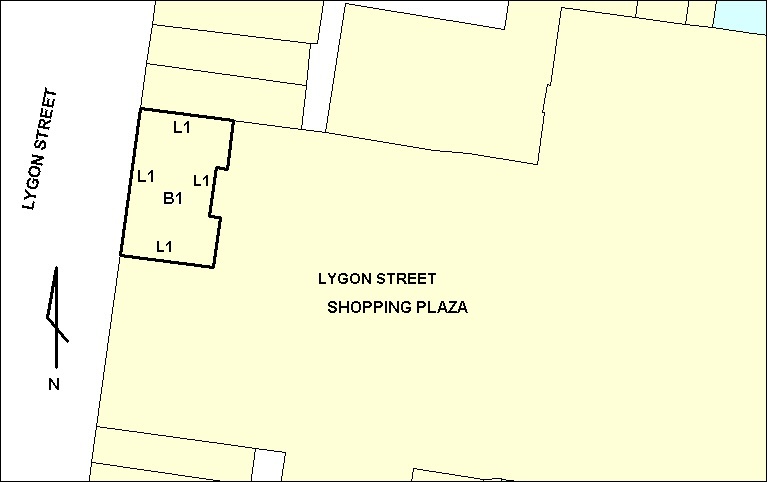 Each of the three buildings comprises a basement, ground floor retail space and upper floor offices. The full length verandah rests on cast iron columns decorated with Corinthian capitals. The bowed canopy in front of the central shop incorporates the wording Holdsworth Undertakers. Each shop is accessed from the street via splayed entrances. Each shop has stairs which lead down to the basements, each lined with basalt and brick. The interiors of the ground floor retail spaces, which are open plan, have been totally modernised. The upper storey of each shop is only accessible via a modern stair at the rear, within the shopping plaza. Most of the fixtures and fittings in these spaces have been modernised, although a pressed metal cornice survives in one room. In the roof of the centre building is a lantern light and a pressed metal ceiling. The lantern light was possibly introduced by Holdsworth when he took over the building. The facade of the upper storey is slightly recessed behind the shop fronts, forming small balcony areas between the projecting party walls of each shop. The balconies have a balustrade of decorative cast iron panels, with cast iron columns and a decorative frieze. The centre bay is distinguished by coupled columns, in contrast to single columns on the flanking balconies. The buildings now stand on a much reduced footprint, the result of the shopping plaza development in 1984 which removed the rear wings to make way for a retail development. The Holdsworth Building is of architectural and historical significance to the State of Victoria. 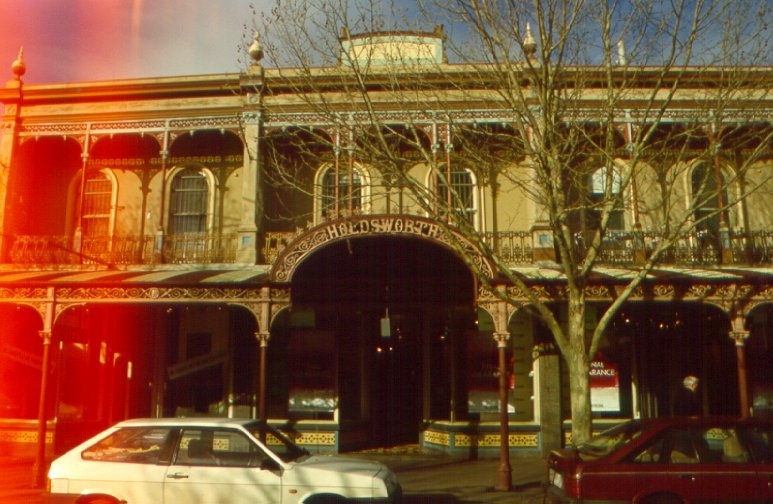 The Holdsworth Building is architecturally significant as an example of a mid-Victorian retail and residential development. The first storey balconies are particularly unusual, notably for the elaborate balustrade of decorative cast iron panels, and the cast iron columns and decorative frieze which are more normally associated with purely residential styles. 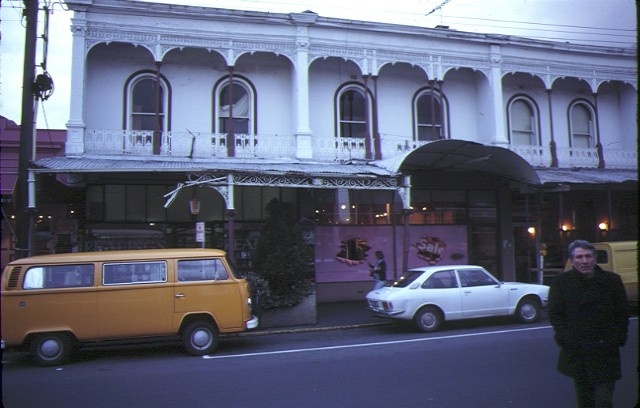 The verandah, with its distinctive central bowed canopy, is a rare survivor of a type that was once very common in Melbourne. The Holdsworth Building is historically significant for its long association with the undertaking and funeral trade. The association of the central shop with undertakers, through two firms, extended from the time of its construction in 1870 until the early 1970s. The building, being slightly grand, is representative of nineteenth century funeral parlours which operated primarily as offices. The location of these buildings close to Melbourne General Cemetery demonstrates the close physical relationship between funeral parlours and cemeteries in the nineteenth century. Holdsworth Buildings, 380 Lygon Street, Carlton, Melbourne City Council. 1. All of the building B1, as marked on Diagram 74 held by the Executive Director. 2. All the land marked L1 on Diagram 74 held by the Executive Director, being described in Plan of Consolidation CP162246N Certificate of Title Vol. 9892 Fol. 175 in the Parish of Jika Jika. The Cyclopedia of Victoria (Vol III p 170) listed Alfred Allison as a furnishing undertaker and embalmer with a head office at 221 Victoria Street, West Melbourne. The Allsion's had several branches of business in the inner northern suburbs. The business was founded by Henry Allsion, succeeded on his death in 1884 by his son Alfred. Alfred died in 1889 leaving the business to his son -in-law Walter Downing. When Downing died in 1900 the company continued trading as Allsion's under the ownership of Downing's widow. Rayboulds was another early undertaking business, established in 1852 by James Francis Raybould. Raybould conducted thew first burial at St Kilda Cemetry and the first at Springvale Cemetery. He was a promoter of the first railway funeral train to the necropolis (Cyclopedia of Victoria Vol III pp 169-170). 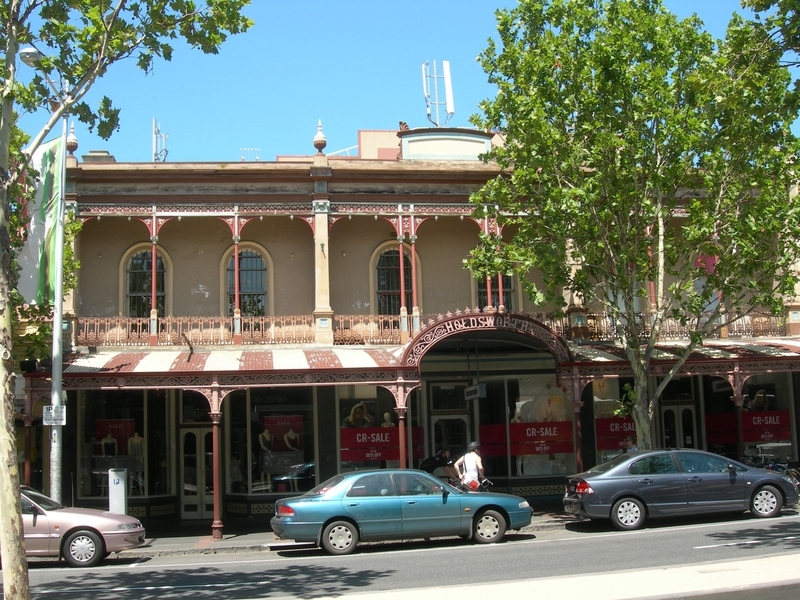 Architect George R Johnson tendered in the Argus on 5 May 1871 for the construction of three shops and residences in Lygon Street for owner John Daley. He tendered for the finishing of the buildings in the Argus on 12 October 1871 (Lewis Architectural Index). Daley was an undertaker. It is claimed that when his business was based on the corner of Victoria and Spring Streets he conducted business solely for Catholic clients. His business declined in the early 1930s when he continued to rely on horse transport rather than invest in motor cars (An Historical Survey, Undertakers and Cemeteries in the Carlton Area, Richard Thorp, BArch Thesis, September 1967 p 37). Until the 1920s most funeral corteges left the home of the deceased after a short service. "At no time was any building specifically constructed for an undertaker." Op Cit Thorp p 21) The busiest time for undertakers was during the influenza epidemic of 1919 when Holdsworth's were conducting up to five funerals per day (Op Cit Thorp p 40). When Squizzy Taylor's funeral was conducted by Holdsworths in 1927, it was an extremely lavish affair with a gold ornamented coffin, white horses, drays full of flowers, a vast procession and police in attendance. Taylor was buried in Brighton, and the funeral bill remained unpaid (Op Cit Thorp p 42). Holdsworth?s relied on refrigeration of bodies rather than embalming, unless the body was to go overseas, as was common for Italians and Greeks. A temperature in the low 40Fs was required. There is no visible evidence of refrigeration surviving in the Holdsworth Buildings. * All internal fitout works other than structural works or works which impact on the shopfront, or the pressed metal ceiling and lantern light at first floor level in the central shop, are permit exempt. * Refurbishment of existing bathrooms, toilets including removal, installation or replacement of sanitary fixtures and associated piping, mirrors, wall and floor coverings. * Installation, removal or replacement of electrical wiring and lighting provided that all new wiring is fully concealed and any original light switches, pull cords, push buttons or power outlets are retained in-situ. Note: if wiring original to the place was carried in timber conduits then the conduits should remain in-situ. The purpose of the permit exemptions is to allow works that do not impact on the significance of the place to take place without the need for a permit. The primary significance of the building lies in the facade (including the form of the ground floor shop fronts), the verandah and the lantern light and pressed metal in the central building. The open plan nature of the ground floors probably dates back to construction and reflects their function as retail space. Ideally this layout should not be altered structurally although internal fitouts will be required, reflecting retail requirements. Internal alterations to other floors are less critical.